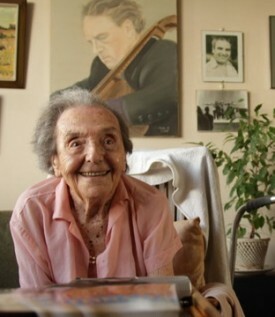 Until her death at 110, Alice played classical music on her piano each day in her small flat for two and a half hours. She became known as “The Lady in Number 6,” now an Oscar-nominated movie. Her mother and husband died in the camps. She harbours no hatred for her losses. She spent two years sleeping on a floor every night with her young son, who was five when they came face to face with their potential exterminators. She didn’t want her son to worry or be afraid so every day she chose to find good things they could enjoy. Most of the time she was the only one laughing. She felt it was important that her son hear her laughter then he wouldn’t be afraid. We think it’s impossible to be thankful in adverse circumstances. But, Alice Hertz Sommer teaches us that we can find hope and optimism in the blackest of times. God has filled the world with beauty. Will you allow one tiny sliver of that beauty to penetrate your soul today? 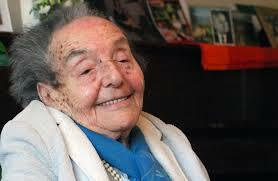 If you do, your thoughts will fill with the same optimism and hope that Alice Sommer experienced. God’s plan for you is that your life be filled with joy. Gallery | This entry was posted in A Friend, forgiveness, Inspiring People and tagged Alice Hertz Sommer, always be joyful, classical music, holocaust, hope, inspiration, joy, laughter, optimism, pianist, survivor, thankfulness. Bookmark the permalink. Carson – Love that you, my son, read my words. This warms my heart!! So much of Proverbs is addressed to “son.” He says, “Listen, my son, . . . forsake not your mother’s teaching.” May the blessing of wisdom rest on you. How someone can come through what Alice did and remain optimistic, is inspiring to all. Her legacy will live on, for sure. What a beautiful story, Rose, of a wonderful lady. Mrs. Sommer’s is such an inspiring legacy to leave behind. Thank you for this story.